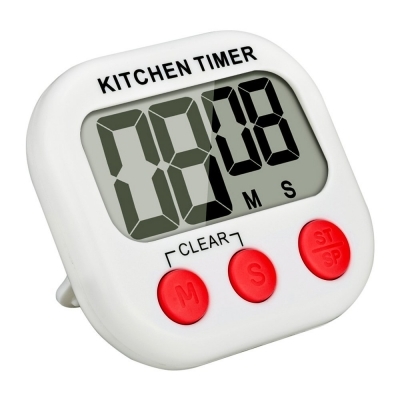 The Mudder digital kitchen timer is a simple timer for daily limited time activities, especially for cooking issues. You will not miss your time because of the loud alarm, and you will enjoy the cute design and flexible placements with its strong magnetic force and hook back. It also can be applied to sports, midday rest and learning time control. It is a useful helper to make you be the host of your own life. 1. When you put an AAA battery in the timer, you should flatly push the cover in back. 2. Tear off the plastic film of the screen at the first time you operate it. 3. The timer can be adsorbed by steel furniture, such as refrigerator or the steel cover of hood. 4. When you don't need it to work, remember to turn the black switch off. 5. Press the minute or second button over 2 seconds which could adjust the timer fast.